Enjoy New Amp Match Technology and dive deeper with more tone-shaping abilities. Your tone is your identity – and sometimes nothing less than a custom setup can deliver the goods. 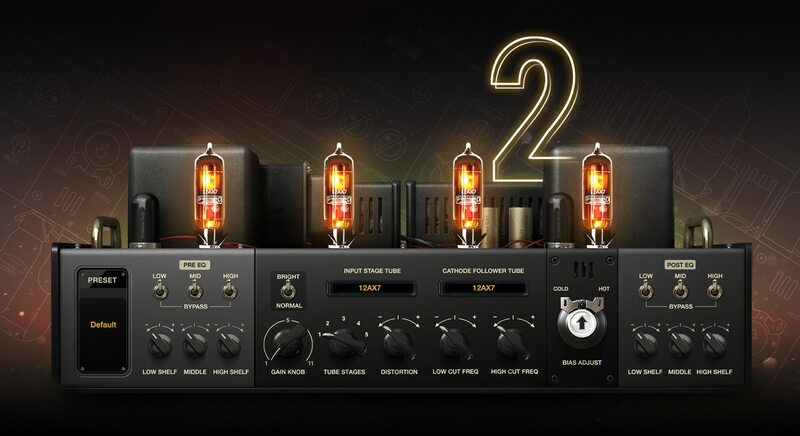 BIAS AMP 2 PRO is the ultimate virtual amp designer, authentically recreating the tone and feel of real tube amplifiers, while allowing you to mix and match components to create your ideal amp. You can use Amp Match to clone the tone of real hardware or a guitar track, or connect to the ToneCloud® to gain access to thousands of custom amps from artists and recording studios, or upload your own custom tones to the cloud. BIAS AMP 2 PRO represents a revolution in virtual amplifier design, providing the tools to take your ultimate guitar tone with you anywhere, from the studio to the stage and back again. For BIAS AMP 2 we worked with artists, engineers and recording studios to improve the already hyper-authentic touch response of our amplifier circuits. The result is a new playing experience, with increased touch responsiveness and dynamics. With new tubes, transformer, dynamic tone control and a completely redesigned speaker cabinet module with multi-mic capability, you now have the tools to take your tone explorations further than ever before! Along with BIAS AMP’s built-in amp packs, BIAS AMP 2 adds two new amp packs that widen the sonic palette even further. Blues is all about gooey clean to mid-gain amps, and Bass brings amps and speaker cabs just for bass guitars. Add in all of the custom component options, and you have literally thousands of custom amps at your fingertips. There’s nothing else like it! Even if you’re not interested in matching amps yourself, you can still take advantage of the power of AMP Match by connecting to the Positive Grid ToneCloud® and enjoy 100 new custom AMP Match presets. There are thousands more from artists, recording studios and guitarists from around the world. The Positive Grid ToneCloud® is more than just a simple storage tank for your own custom amps - it’s an online community where musicians from all over the world can share and discuss tones, to the benefit of everyone. There are thousands of custom amps on the ToneCloud®, uploaded by artists, recording studios and guitarists just like you. Download artists' signature amps, or try out the latest and most popular matched amps created by your fellow guitarists. The tone-creation possibilities are nearly infinite with BIAS Amp 2, which comes with 100 new custom amps in a variety of genres. Download artists' signature amps, or try out the latest and most popular matched amp models created by your fellow guitarists. It doesn’t matter what kind of music you play or what kind of tone you’re looking for – chances are good that it’s on the ToneCloud®. BIAS Amp was designed to integrate directly with BIAS FX, Positive Grid’s flagship amp-and-effects processing environment. All of the custom amplifiers you create with BIAS Amp 2 are automatically available in BIAS FX, providing a foundation for your ideal finished tone. Start with an amp that fits your playing like a glove in BIAS Amp 2, and then open it in BIAS FX and add pedal and racks effects. It’s a seamless and revolutionary workflow, making it easier than ever to create your own signature tones! Internet connection is required to activate license and access Tone Cloud, Positive Grid Desktop products don’t support offline activation at this moment. It can run under offline mode after activation and disable Tone Cloud.